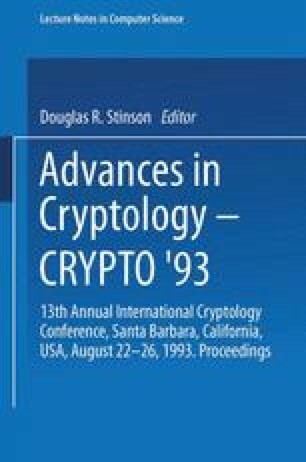 Three attacks on the DES with a reduced number of rounds in the Cipher Feedback Mode (CFB) are studied, namely a meet in the middle attack, a differential attack, and a linear attack. These attacks are based on the same principles as the corresponding attacks on the ECB mode, They are compared to the three basic attacks on the CFB mode. In 8-bit CFB and with 8 rounds in stead of 16, a differential attack with 239.4 chosen ciphertexts can find 3 key bits, and a linear attack with 231 known plaintexts can find 7 key bits. This suggests that it is not safe to reduce the number of rounds in order to improve the performance. Moreover, it is shown that the final permutation has some cryptographic significance in the CFB mode. N.F.W.O. postdoctoral researcher, sponsored by the National Fund for Scientific Research (Belgium). N.F.W.O. research assistant, sponsored by the National Fund for Scientific Research (Belgium).